For weeks now, our local newspaper has been running a full-page ad for the PIGGEST. RAFFLE. EVER. It exhorts me to kick-off my summer “the right way, by winning the ultimate BBQ package.” A pink pig, arms akimbo, grins sardonically. If he’d just glance down the page some nine inches, he’d see a chart of his body sliced up into meat cuts. A little less to grin about, no? 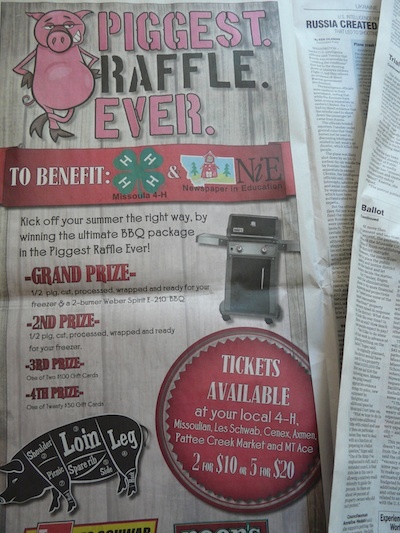 The grand prize is a Weber grill and one-half of a pig. Second place gets the other half.